A commercial auto policy is a necessity for business owners of all sizes even if you only have a few employees, especially if those employees drive a company vehicle regularly or only occasionally. Without commercial auto insurance, you are responsible for paying any physical injury or property damage claims caused by one of your employees while driving a company vehicle. There are several good options for commercial auto insurance. These companies are among the best in providing commercial auto insurance. Progressive Insurance is one of the largest auto insurers in the U.S. and has been in business since 1937. It has an “A+” financial strength rating from A.M. Best and an “A” rating from the Better Business Bureau. Progressive’s commercial auto policy is geared toward small business owners and offers liability and physical damage coverage for vehicles used for business including cars, trucks, commercial trailers and vans. Coverage can be customized to fit your specific commercial auto insurance needs. An excellent feature of Progressive commercial auto insurance is that it will adjust your policy to reflect seasonal changes if you will not be operating a business vehicle or vehicles during a specific period. Commercial auto coverage options include liability, uninsured motorist, collision, comprehensive, individual named insured endorsement, fire and theft, non-owned vehicle, any auto, hired auto, drive other car, single deductible endorsement, medical payments, personal injury protection and pet injury coverage. For trucks additional coverage options include motor truck cargo, motor truck general liability, non-trucking liability, rental reimbursement and downtime and trailer interchange. Tow specific coverage includes garage keepers legal liability and on-hook towing insurance. Liberty Mutual Insurance has been in business for over 100 years and has an A.M. Best “A” Excellent financial strength rating as well as an “A+” rating from the Better Business Bureau. Liberty Mutual’s commercial auto policy offers the standard options of liability and physical damage coverage to small businesses and also large companies including commercial fleets. It also includes some extra services including safety training for drivers and telematics for large customers to monitor driving behaviors and help you find ways to prevent accidents. The “Liberty Mutual Expedite” app allows driving to take photos of accidents and instantly request an estimate from claims experts. State Farm Insurance was founded in 1922 and has an A.M. Best rating of “A++” Superior. It has also been recognized by J.D. Power & Associates as “above average” in overall customer satisfaction. State Farm offers business auto insurance to religious organizations, specialty schools, contractors & home services, personal services & animal care, medical offices, distributors, wholesalers and more. Coverage options include liability for bodily injury and physical damage, medical payments, collision, comprehensive, uninsured/underinsured motorist coverage. You can also add coverage for Employers Non-Owned Car Liability (ENOL) which protects you if an employee drives his own vehicle for business purposes and becomes involved in an accident. Nationwide has been in business for over 80 years and has an “A+” Superior rating from A.M. Best. Its commercial auto policy can be customized to your specific commercial auto insurance needs. You will also have access to a team of risk management professionals who can help you minimize losses and manage risks. The commercial auto policy from Nationwide includes coverage for auto liability, medical payments, comprehensive, collision, uninsured/underinsured motorist, coverage for borrowed or rented autos and coverage for employees who use their own cars for business purposes. Nationwide offers it commercial auto policy holders a written guarantee on repairs when using a repair shop out of their auto repair network for as long as you own or lease your vehicle. All mechanics within the Nationwide repair network are pre-screened and pre-qualified to insure quality vehicle repairs. The Hartford has been insuring customers since 1810. It is one of the oldest insurers in the U.S. A.M. Best financial stability ratings for The Hartford and all its subsidiary companies range from “A” to “A+.” The Hartford has also gained recognition for customer service from Insure.com and J.D. Power & Associates. The Hartford commercial auto policy comes with all the standard coverage options and is customizable, meaning you can add additional coverage for rental reimbursement and towing. For fleet owners, the Hartford offers the services of its risk engineering team with safety advice on avoiding accidents, defensive driving and more. It also has a “FleetAhead” program which uses telematics to identify risks and prevent accidents. Coverage is available for electronic devices and discounts are available for hybrid/natural gas vehicles. The Hartford has a glass repair waiver when a covered vehicle requires glass repair. Travelers is the second largest property and casualty insurance company in the United States. Travelers and all its subsidiary companies have an “A” or greater financial stability rating from A.M. Best. Travelers also has been recognized by Insure.com and J.D. Power & Associates for excellence in customer satisfaction. Its commercial auto policy offers coverage to many industries and specializes in commercial auto for cargo carriers and commercial fleets. The Travelers commercial auto policy includes coverage for liability, uninsured/underinsured motorist, and physical damage (collision, comprehensive and specified causes including theft, vandalism, hail, windstorm, flood, fire and explosion). 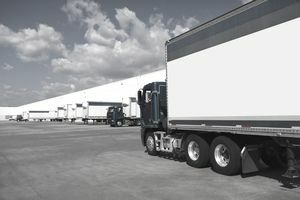 The commercial fleet policy adds coverage for general liability for truckman class, cargo, inland marine, workers compensation and includes free regulatory filings.